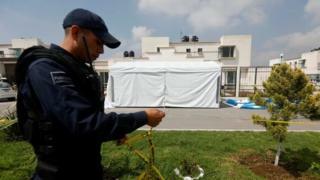 Masked men burst into a children's birthday party in the Mexican city of Tizayuca in central Hidalgo state, killing 11. Police said they had found three children alive at the scene but all 11 adults at the party had been shot dead. It had taken place in a tent set up by the host outside their home in a residential area of the city. Mexico has recently seen a surge in violence linked to disputes between drug cartels. In May alone, 2,186 killings were recorded - approximately 70 a day. A recent trend has seen hit men murdering whole families, including children.